The 20mm M940 Multipurpose Tracer-Self Destruct (MPT-SD) combines a light armor and high-explosive capability into a single round for maximum terminal effects on target with improved lethality. Developed and qualified for use with the M163 self-propelled and M167 towed VADS and PIVADS (Product Improved Vulcan Air Defense Systems). 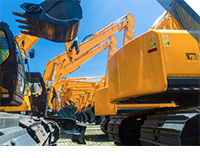 The M940 is an optimal single round solution for ground-to-air and ground-to-ground applications. 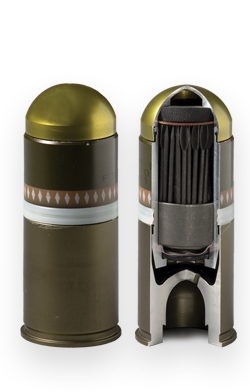 The 20mm Counter-Rocket, Artillery Mortar (C-RAM) cartridge is a Multipurpose Tracer-Self Destruct (MPT-SD) round that combines a light armor and high-explosive capability into a single round for improved lethality on all targets. 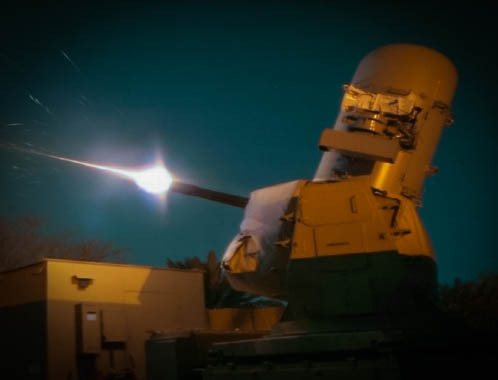 C-RAM is a land based version of the Phalanx CIWS used to detect and/or destroy incoming artillery, rockets and mortar rounds in the air before they hit their ground targets. 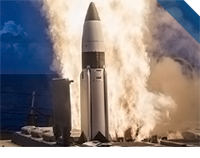 Over 20 million rounds produced for the U.S. NAVY’s PHALANX Anti-Ship Missile Defense System. 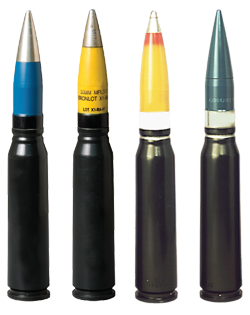 The 20mm MK149 Armor-Piercing Discarding Sabot cartridge provides a significant anti-armor capability with optimized ballistic performance and short time-of-flight to target. 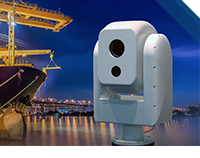 Compatible with the NAVY’s PHALANX Anti-Ship Missile Defense System and the M61 and M197 gun systems. 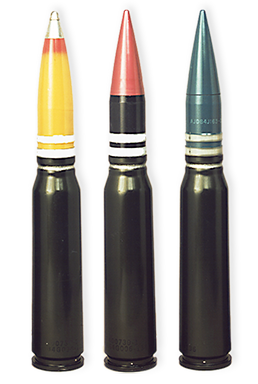 The 20mm Mk244 MOD O APDS Enhanced Lethality Cartridge (ELC) with Compacted Ball Powder® Propellant gives the MK15 Block 1B system full effectiveness against fast attack boats, anti-ship missiles, helicopters, small water craft and low flying planes. The 20mm x 102 PGU Suite have an optimized aero ballistic shapes that reduces time-of-flight and increase velocity at range for increased probability of hit. The PGU-28A/B Semi Armor Piercing High Explosive Incendiary (SAPHEI) provides broad target spectrum capability by combining light armor and high explosive features into a single round. 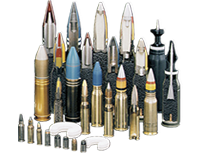 The PGU-27A/B TP and PGU-30A/B TP-T are cost-effective training rounds ballistically matched to the PGU-28A/B. 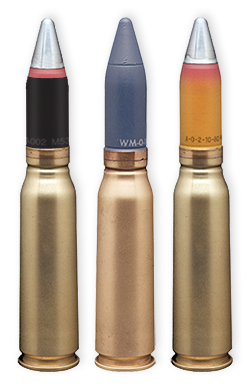 The 20mm M50 series ammunition is compatible with all 20mm M61, M197, M39 and M621 gun systems worldwide. 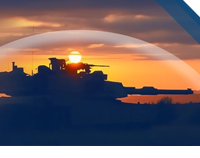 General Dynamics Ordnance and Tactical Systems M50 Series ammunition is established, proven and reliable ammunition suite. The 25mm MK2 MPT-SD was developed to be compatible with 25mm x 137 gun systems. 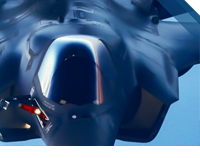 It’s primary role is for air-defense and surface/shipboard applications, providing for optimum terminal effects on all classes of aircraft, helicopters, surface vessels and light armored vehicles. 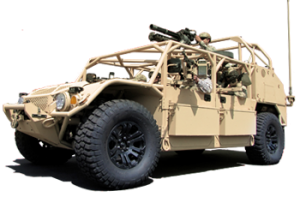 General Dynamics Ordnance and Tactical Systems has qualified, co-produced and delivered the MK2 MPT-SD for armed forces around the world. 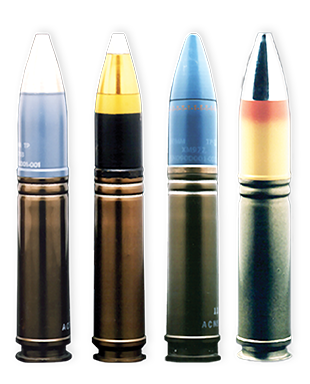 The 25mm Tungsten Armor-Piercing, Fin-Stabilized, Discarding Sabot-Tracer (APFSDS-T) provides superior defeat capability over the M791 APSDS-T round for the Bradley Fighting Vehicle. 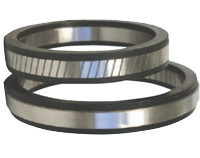 The long rod tungsten penetrator, of this highly effective anti-armor round, has excellent penetration characteristics with minimal dispersion. It is capable of defeating a wide array of target sets, including most modern armored infantry vehicles and armored personnel carriers. 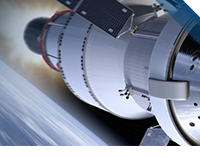 Fully compatible with all platforms using the M242 and KBA-B02 25 x 137mm gun system. The Improved 25mm cartridge, the PGU-32/U SAPHEI-T, was designed to provide aerial and surface gun platforms with improved effectiveness against soft and light armored targets. 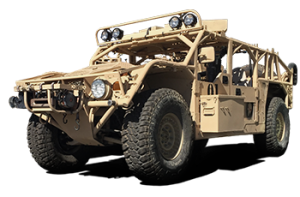 The PGU-32/U incorporates multipurpose technology providing: inherent detonation delay; improved graze sensitivity; and light armor capability. 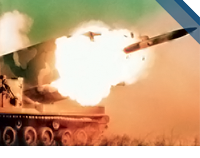 The PGU-32/U provides greater capability on target over the current 25mm HEI ammunition. 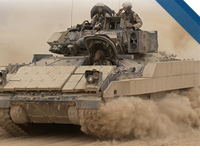 The PGU-32/U SAPHEI cartridge is fully interoperable in the Army Bradley Fighting Vehicle and the Marine Corps LAV. The PGU-32/U is also type-classified for the AV-8/B Harrier and Mk38 Navy platforms. 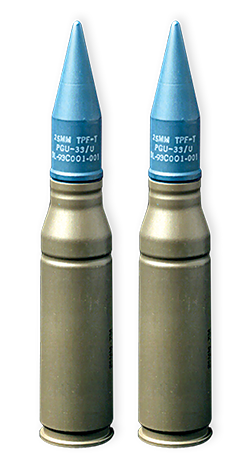 The Improved 25mm training cartridge, the PGU-33/U TPF-T, resolves a long-standing ricochet problem associated with air-to-ground scenarios. The PGU-33/U cartridge incorporates a frangible projectile that breaks up into small non-ricocheting fragments upon impact with the target. 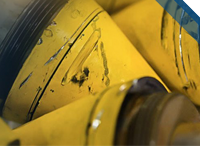 The PGU-33/U utilizes a projectile made of unique advanced powder metal material that combines the Strength and toughness of typical steels with the brittle and frangible properties achievable with powdered metals. The PGU-33/U provides greater safety while training to the pilot or aircraft. 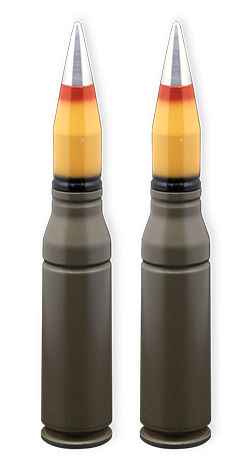 The 25mm x 137 Bushmaster Ammunition Suite was designed to defeat an array of threats from dismounted combantants to heavy armor platforms. The suite is operable with M2/M3 Bradley, MK38 Naval Gun, ASLAV, LAV-25/LAV-AD, M113 APC and other light armored vehicles. 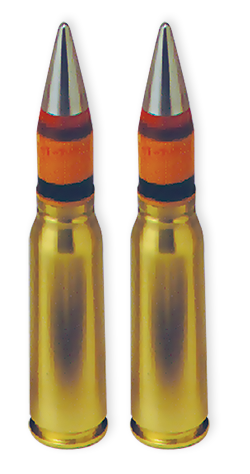 Our 25mm Bushmaster ammunition meets or exceed military performance requirements. 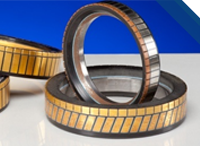 Over 25,000,000 rounds of this family have been produced with proven success in the field and is in service with the United States Army and Marine Corps. 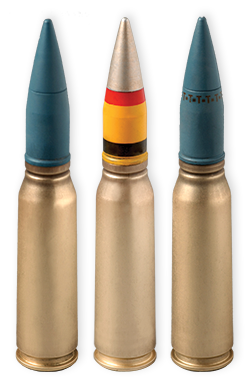 The 30mm x 113 M789 HEDP and the M788 TP are produced with a steel cartridge case to ensure safety and reliability. 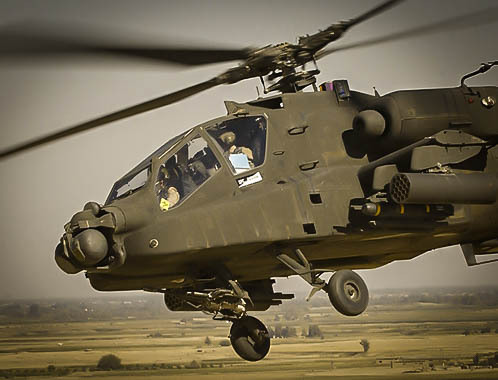 The cartridges are fully operable with the AV-30 (M230) Chain Gun turret used on the Apache helicopter. The AV-30 turret can be integrated on a variety of light vehicle applications including Pandur, M113, and Piranha. 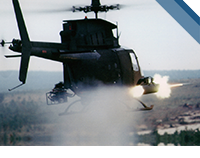 The M789 HEDP carries full effectiveness inside lightly protected threats with projectile detonation delay to maximize effects inside the target. The cartridge’s demonstrated graze function is effective for area suppression. 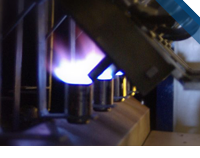 General Dynamics Ordnance and Tactical Systems’ has produced more than 100,000,000 30mm GAU-8/A ammunition suite. Not only combat effective, but cost-effective, the PGU-15/B is the lowest cost target practice cartridge of this caliber in the world. 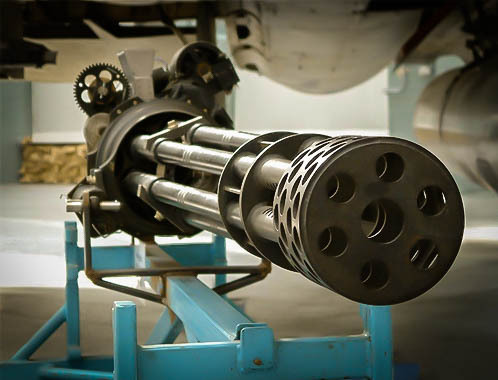 The 30mm x 173 family has been used in the GAU-8/A Gatling Gun, the Goalkeeper CIWS, and the Bushmaster II. 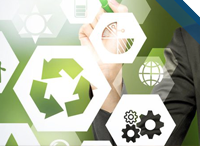 Derivatives of the 30mm X 173 GAU 8/A family have been developed and qualified by General Dynamics Ordnance and Tactical Systems for use in the 30mm Mauser Model F Gun Systems. 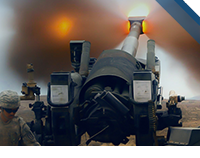 The Mk44 Cannon Ammunition suite provides high performance ammunition for the Mk44 cannon across a variety of weapon platforms. 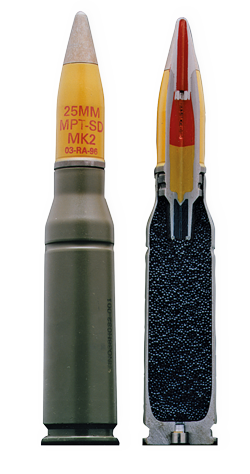 The MK264 MPLD-T provides light armor-piercing capability with a delayed explosive reaction using a chemical fuze. 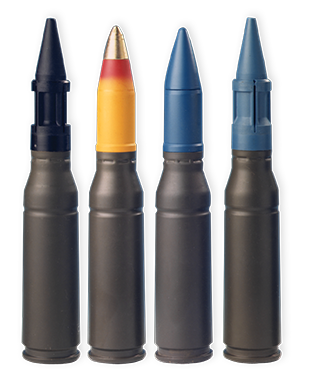 The MK239 TP-T is a low-cost training cartridge, ballistically matched with the MK264. 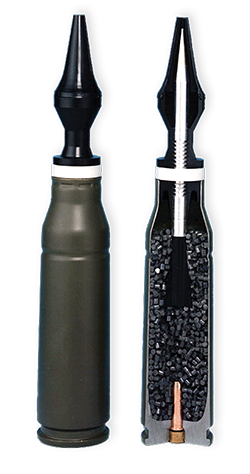 The PGU-13D/B uses the M505 fuze, providing a high explosive round that has been used by the US Air Force extensively. The PGU-15A/B is a low-cost training round ballistically matched with the PGU-13D/B. 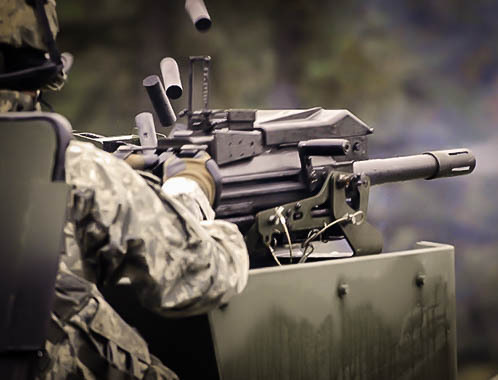 The M1001 40mm High Velocity Canister Cartridge (HVCC), fired from the MK19 Grenade Machine Gun (GMG), allows the operator to radically change use of the MK19 GMG from a stand-off area weapon to a short-range anti-personnel and perimeter defense weapon.